Home > Blog > Summer 2013: Where Were the Monarchs? Summer 2013: Where Were the Monarchs? The sad answer is this: Nope, you weren’t doing anything wrong. There simply weren’t very many monarchs around this summer in the eastern half of the U.S. The reason is actually a combination of factors that started well over a year ago. Extremely Low Wintering Numbers: Over the winter of 2012 – 2013, the overwintering population in Mexico reached an all-time low. The numbers are pretty staggering, actually – the winter population was a shocking 80% below normal. An average year sees about 350 million overwintering monarchs. The winter of 2012-2013 saw only about 60 million. A Cold Spring: As if this weren’t enough, the monarch population suffered another blow in the spring of 2013. The monarchs completed their spring migration back to Texas, where generally this generation mates, lays eggs, and dies. This new generation was met this past spring with unusually cold temperatures late into the season, meaning this monarch population was slow to grow, mature, and continue the journey north. Ultimately, it led to many fewer monarchs making the migration journey, and even fewer of them completing the trip as far north as southern Canada, where they usually top out. So, no, you weren’t alone if you didn’t see much in the way of monarchs this summer. They suffered a sort of “perfect storm”, making them rare in much of their eastern range in the summer of 2013. NOTE: Monarch populations in other areas, such as California and Florida, fortunately have not reported such dramatic losses in the past year. These monarchs have their own migratory patterns (if they migrate at all) and so have not been as severely affected by the factors listed above. Butterfly gardeners everywhere want to know… what can we do to help? The answer is: keep doing what you’re doing, and get more folks to do it too! If you’re creating a monarch-friendly environment in your garden, with lots of nectar plants and milkweed, and no pesticides or other chemicals, you’re doing the right thing. Encourage neighbors and friends to do it too. Get a local school or community to plan a butterfly garden for 2014, and fill it with native milkweed. The citizen science site Journey North has been tracking monarch populations and migrations for years, and is an incredibly valuable source of info. Anyone who loves monarchs and wants to help should visit this site regularly for resources and to help them gather data. This year’s migration is already underway, with folks reporting monarchs gathering in larger and larger numbers as they head south. If you live along the migration path (and that’s really anyone east of the Rocky Mountains), you can help them complete the journey south by keeping your garden full of nectar flowers. Monarchs must feed continuously throughout their journey to make the long trek, so keep your garden full and happy until the first frost. Gardens in Texas are especially valuable, since most migrating monarchs will funnel through here on their way to Mexico over the next few weeks. You can learn more about the decline of the monarch population, both recent and on-going, on the Journey North site. Educate yourself about the issues, and then spread the word about the need for butterfly gardeners to help out. Monarchs are down, but most certainly not out! Join in the fight to help them survive. Yesterday we saw milkweed plants out at Lake Red Rock, Iowa, full of Monarch caterpillars. Is this late in the season for that? I’m used to seeing them much earlier. Thanks for your article. I photograph lots of wildlife and love taking photos of butterflies since I retired. I’m trying to learn more about the butterflies I find here in Iowa. found a Monarch floating in our pond..so I scooped him out, and he moved!!! He managed to climb on my shirt, then on my neck. I knew he had to dry off before he could begin to fly…and that was taking it time …so I put him in a corner of my deck hoping nothing would get him..First thing next morning I looked to see if he was still there, and he was…This went on for two days until I realized he had broken his wing…and I knew he would never fly again…so I went to Google and read how to fix a broken wing, and I knew I could do that..As gently as I could I repaired the break….but he wasn’t eating it died later on that day… I was sad that I couldn’t help the little guy…. I subscribe to birds and blooms; noticed also the monarchs were few in number this year. The yellow swallowtail over my bush was spectactular. Monarchs are a welcome sight for me. I had wondered about this. We seem to have had an overabundance of Eastern Tiger Swallowtails this year, but I have seen only one monarch all summer. Excellent article! actually this decline started a few years ago with that cold mexico winter and large die-off, didn’t it? It has been a few years since I have seen any significant numbers of monarchs in NeW England. I was lucky enough to have a few monarchs lay lots of eggs on my milkweed & have tagged & released 150 with another 75-100 in chrysalis stage! Last year my total was 30, a far cry for the 500 from 2011. With the drought I was afraid It would be another bad year for me. I live I southeast Missouri. I’m so glad I’ve been able to do my part in getting the numbers back up! My milkweed looked sickly all summer. I thought it was the reason I saw very little monarchs this year. We had so much rain this summer that I wish we could have shipped some of it out to the rest of the country who needed it. I live in Keithville,Louisiana and have seen one lone, ragged, but beautiful monarch all summer. It seemed to say, “take my picture anyway, I’m still beautiful!”, so I did. We have had a drought for the past few years and there are not as many wildflowers blooming on our land as usual so the numbers of all varieties of butterflies are down. If you have butterfly weed and want to keep it blooming longer, clip off the first blooms just before they get to the stage to begin the formation of seed pods. You will get another bloom stage from them and that one will make plenty of seed pods. The trumpet vines on our land also did not bloom well this year and the hummingbirds have kept me busy making sugar water for their feeders. There do not seem to be as many of them this year, either, in spite of the fact that I put out more feeders. Trumpet vines in Shreveport seem to be blooming, but we seem to live in a pocket that the rain clouds miss at times, although we finally got some rain last week. Drought and deer-resistant plants seem to be the only answer for now and that is my plan. There are some good ideas on this blog. there are less birds last fall. I really miss my pretty yellow finches and hardly ever see a little wren. Here in Chula Vista CA (5 miles from Tijuana, Mexico) I had a bunch of Monarchs flying and laying eggs. I had increased my milkweed from 2 plants to 13 plants and all my neighbors where commenting on all the Monarchs on our block. Lots of caterpillars all over plants, it is amazing how quickly the plants recover from the striping of all the leaves.I watched as the eggs were laid one by one on the leaves. Last year I was able to capture the process from emerging to full flight I took photos every few seconds to record the whole thing what a blessed event that was! 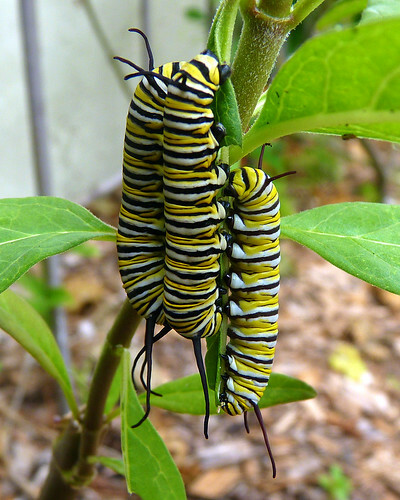 I live in Delray Beach on the SE coast of Florida……I was inundated by Monarchs this summer and they are still laying eggs on my milkweed…..I counted almost 100 on 3 plants at one point….and I had to make an emergency milkweed run since they ate those 3 plants to the ground. So happy they found my garden. Another thing we can all do is to not buy foods made from GMO grains. These grains have been genetically modified to withstand being sprayed with glyophosphate weed killer; the weed killer is indiscriminate–it also drifts and kills the wild milkweed that the monarch larvae require. The EU has banned GMO foods. I am so glad to have found this article. I raise Monarchs from the caterpillars that I pick off my milkweed. I usually release 50 or 60 each summer. This summer I saw a grand total of two Monarchs and both were in September. I have had no caterpillars. We had very few Swallowtails or the blue and black one that I can’t think of the name right now. I’ve really missed them this year. Next year maybe they will be some to come and I’ll do my best to save everyone of them. I live in Michigan and I also noticed there wasn’t as many Monarchs as normal. Thank you for the explanation. I have swamp milkweed, milkweed, butterfly weed and butterfly bush. I didn’t notice many butterflies but I did have a lot of monarch caterpillars. I was fortunate enough to watch 3 caterpillars turn to cocoons and become those beautiful butterflies. It took nine days and I was so glad I didn’t miss a stage because that was my first time to see this most exciting part of nature. We had also came to our Own Thinking; Our Cold Spring & two Freezing cold Days in May ` affected many Flying Butter flies ~We also was short very much of our Lovely Monarch ~~ I have lots of Milk weeds in my Back Garden~ But have not seen any Eggs or Monarch worms~ At night there seem to be Something eating the Milk wedds ~ Not seen them either~ we miss the many Butter flies we did have over the Last years… Also in April & May the Damaging Storm Very HARD down pours flush off Grounds Of alot of Goods! Plus we add those many Dry Weeks ( up to 2or 3 weeks ) . Even Our Humming Birds was late coming this year! I lived in Wellington, fl -near west palm. I notice a significant decline in monarchs. In past years I have had to makes food runs also due to a ” bumper crop” of monarchs. Not this year – spring was 0k….but after that….very few! I have been watching them lay eggs but I think the damn lizards are eating the babies! I usually I bring the “fatties” in & put them in a large screened container when they are close the chrysalis stage & let them do their thing, then release (beautiful feeling watching 20+ monarchs butterflies take flight…spiritual)! Past few year I release about 150- 175′, this year maybe 40 … Very strange…. Same thing happening to a friend in Hollywood, Fl. Tons of aphids (UGH!!) which is a constant battle to stay on top of, love seeing those lady bugs crawling on the plants!! I can only attribute it to lizards….of which I have plenty!!! Thanks for the post sooo sad the over population is so low…. Hopefully they recovery quickly!! WE MUST ALL HELP !! I am in Seabrook TX and haven’t seen any monarchs until this week. Those have been few and very far between. Last year I had hundreds in my yard over the course of a couple of weeks. Something has destroyed my butterfly weed though and I don’t know what it is. The leaves are chewed up not like the larva of a monarch does. Also there are some other kind of larva on the stalks. Most is a whitish color but I have also seen a couple of small green spiky types. Again not monarchs or like any butterfly larva I have usually seen.